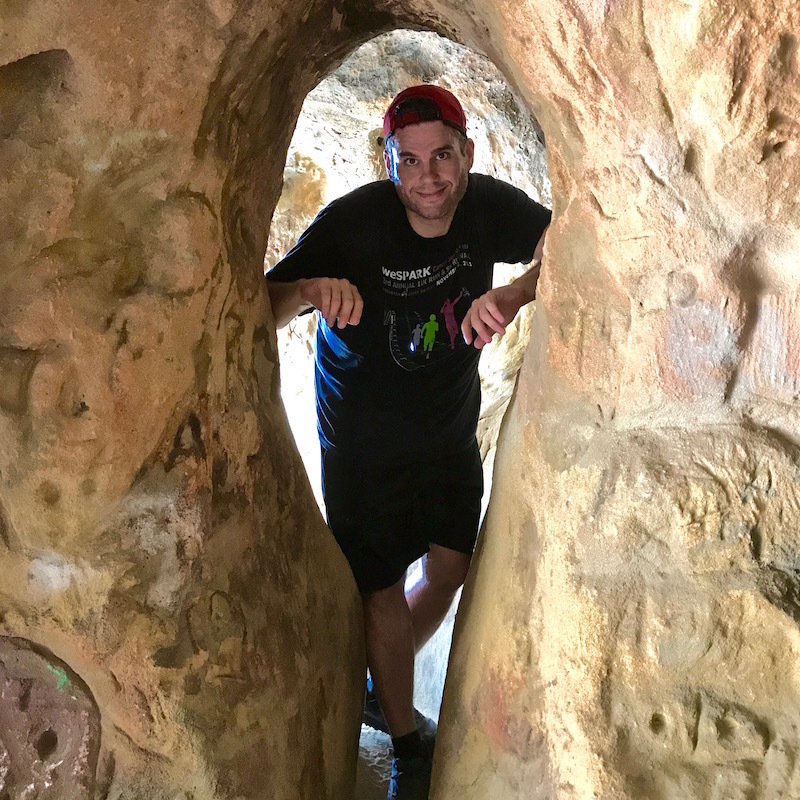 A New Hike Adventure: Exploring Vanalden Cave! | Keep It Up, David! 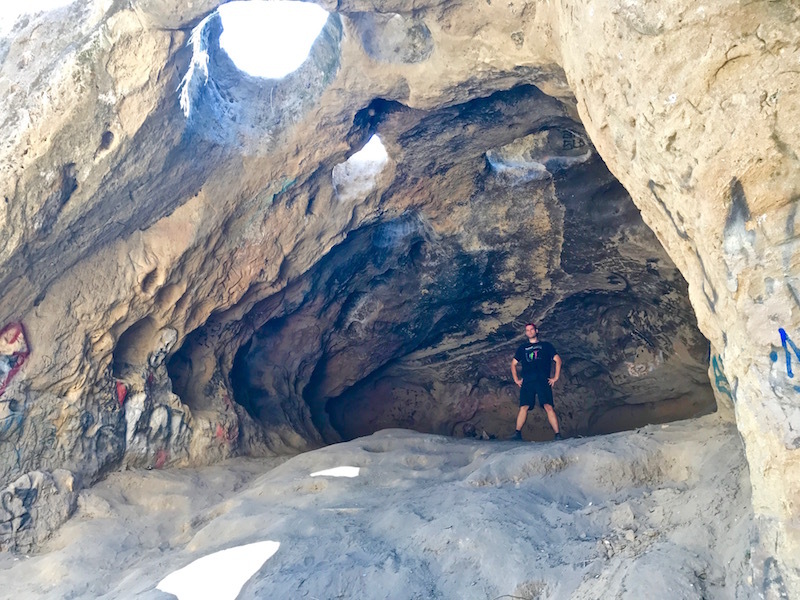 It’s called Vanalden Cave, and it’s in the mountains just south of Tarzana, a valley neighborhood of Los Angeles. I didn’t do tons of research beforehand, but I read that getting there wouldn’t be to difficult: it’s 1.25 miles away from a trailhead at the very southern end of Reseda Boulevard. Don’t make the same mistake that I did: Do lots of research! More on that later. 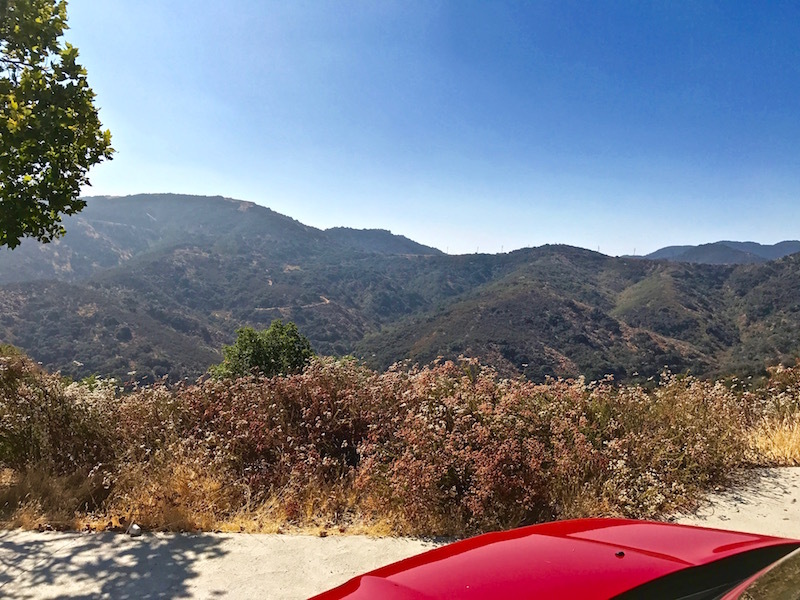 You know it’s going to be a great hike when there’s an amazing view from your parking spot! 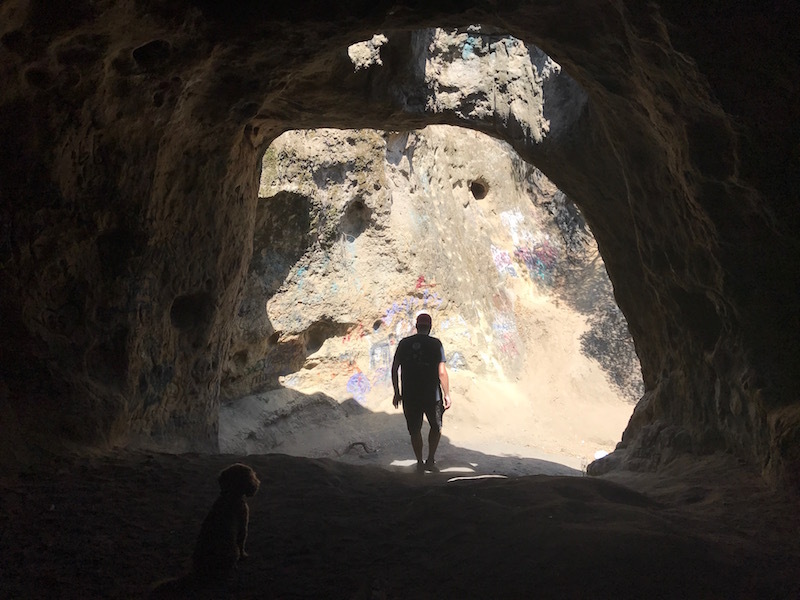 My friend Tavi and his dog Luna came along, and since the cave was only 1.25 miles away, we decided to run it, instead of hiking. There were some ups and down, but nothing we couldn’t handle. 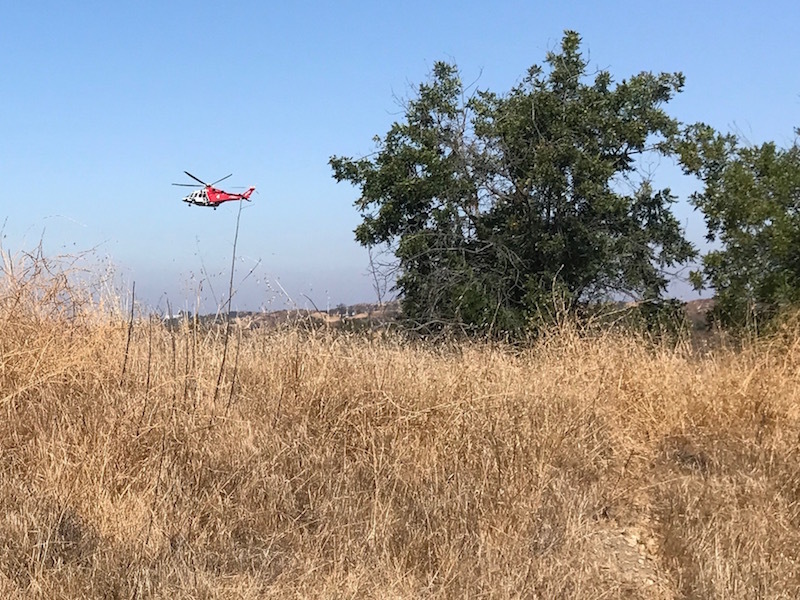 We even saw a helicopter practicing take-offs and landings. Maybe it was doing some sort of wildfire training. Most of the run to the cave was along a wide, dirt fire road. But then we got to a junction where we had to turn off the fire road, and descend into a canyon on a much narrower, much more uneven trail. It was surrounded by tall grasses and just about every thorny, prickly bush known to mankind. 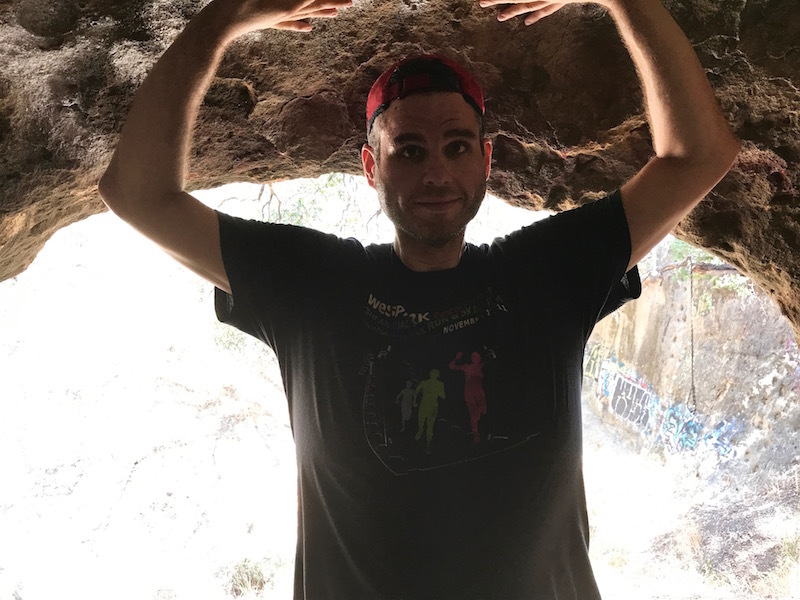 RELATED CONTENT: This isn’t my first cave hike… check out my trip to the Batcave! So we stopped running, and negotiated our way down into the canyon. This is where I realized that I hadn’t done enough research, because we couldn’t find the cave. We made it to the exact spot on the map where the cave was supposed to be, and no cave. We went beyond it, circled back, and went off-trail, looking for things we may have missed. Then we stumbled deeper into the canyon, definitely off-trail, until we reached the dry creek bed at the bottom. It was steep, and parts were slippery (even with my new trail shoes). Since we didn’t know where we were going, I pulled out my phone and started comparing our location with maps of the area, and that’s when I figured out the map we had been referring to was wrong. Just wrong. So… if you go to this cave, don’t use the Alltrails map. Instead, use the one on Hikespeak. And read the description on where to go and how to get there, because it’s helpful. 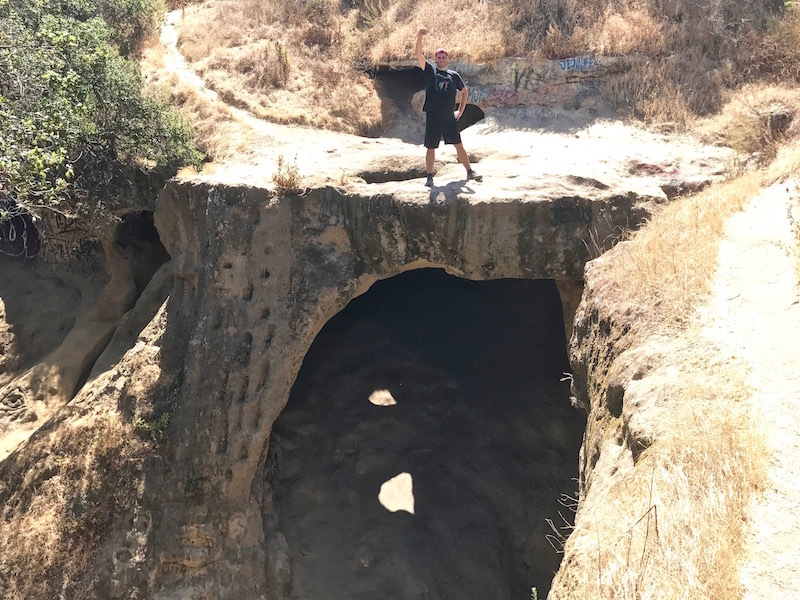 RELATED CONTENT: Another incredible local hike: to an abandoned gold mine! 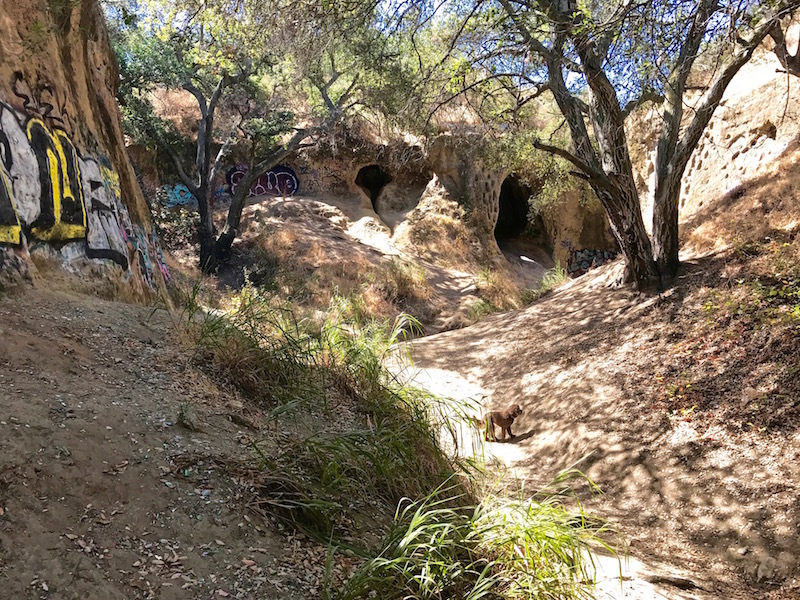 There’s a lot of graffiti, and because it’s made of sandstone, lots of people have carved their initials in the walls because, you know, people are jerks who can’t leave nature alone. But even so, you can’t deny the beauty of this hidden gem. There’s a few holes in the top, like skylights, that flood the cave with natural light. It’s probably 50 feet deep and 30 feet tall, and a very cool place to hang out. There’s a couple smaller rooms and features that you can explore as well. And a nice keyhole-shaped side cavern that makes for a fun photo opportunity. We were the only ones there when we found it. We had the place to ourselves! There’s even a path that leads to the ‘roof’ above the cave. There were a couple paths leading away, and we decided to see if one would lead back to the fire road. Within 50 feet or so, we realized it wasn’t a trail at all, and we were bushwhacking through dead trees and more thorny, prickly undergrowth. We reached a point where it just got too steep, and turned around and headed back. 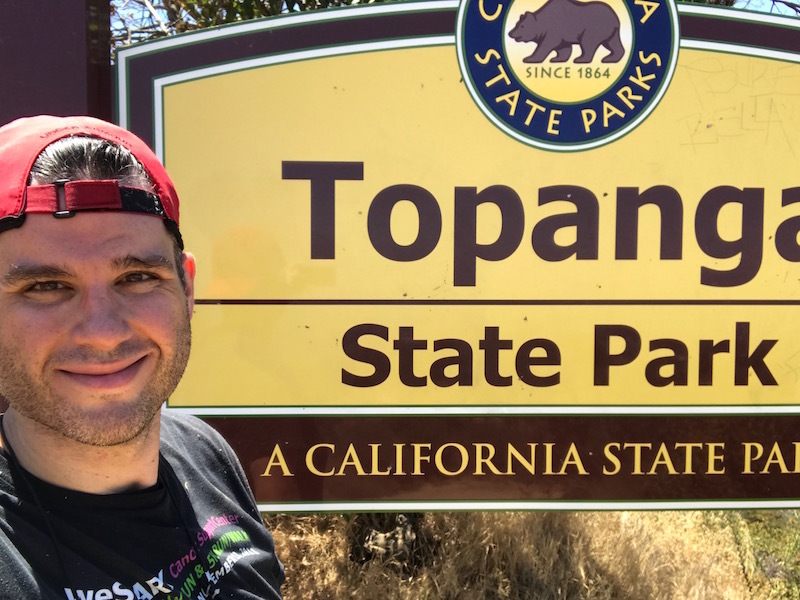 RELATED CONTENT: There’s another great hike just a few miles away, and it begins at a military facility used during the Cold War! After that detour, we took the path back up to the fire road. Originally the plan was to run back to the car, but we were exhausted. 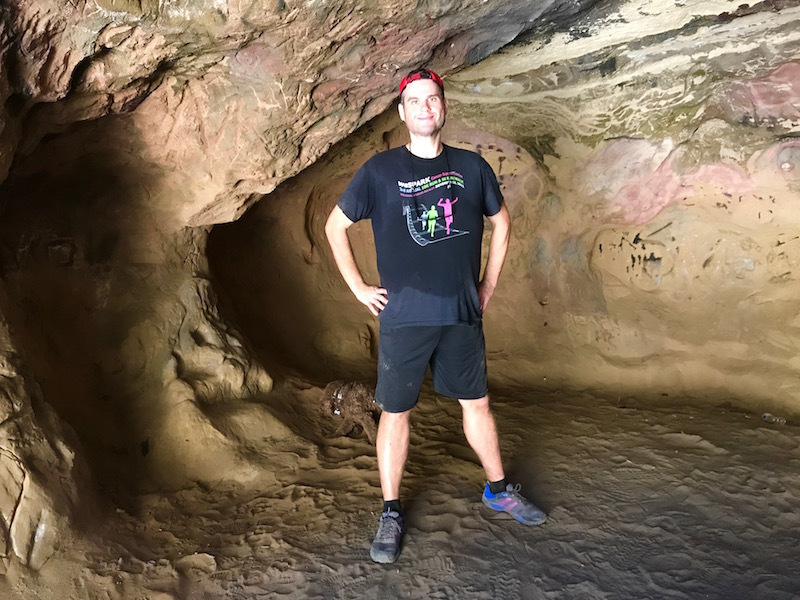 Thanks to our difficulty finding the cave, and our detour leaving it, we had hiked nearly 1.5 extra miles, through rough terrain, and spent probably over an hour doing it. No matter, though – it was a great way to spend a Sunday morning! This entry was posted on Sunday, July 30th, 2017 at 11:30 pm and is filed under Uncategorized. You can follow any responses to this entry through the RSS 2.0 feed. You can leave a response, or trackback from your own site. 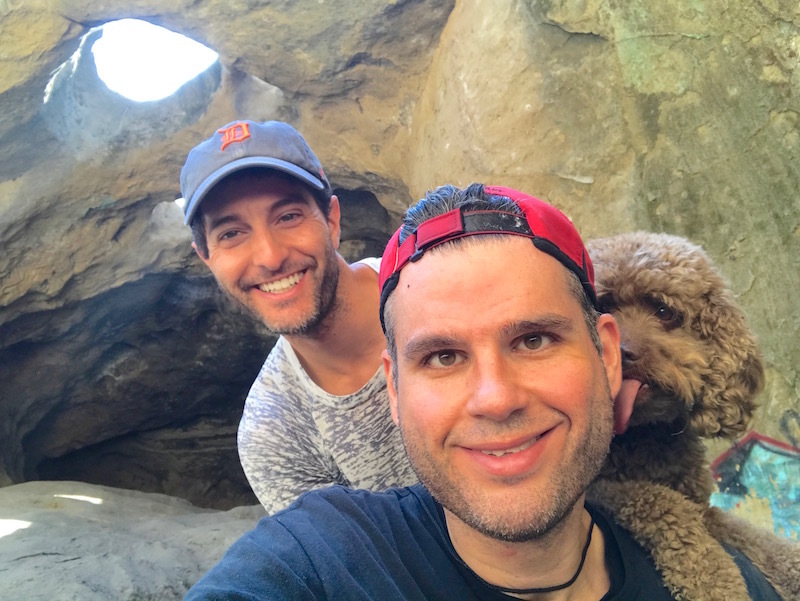 6 Responses to A New Hike Adventure: Exploring Vanalden Cave! Love the last pic with the dog tasting your neck! Same thing I was going to say. Looks like Tavi and Luna photo bombed your selfie!! Haha! Luna had a great time – except she got coated in burrs.